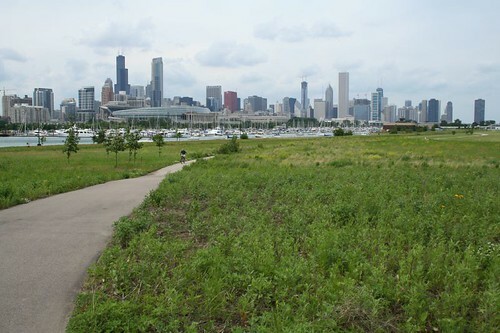 Northerly Island, a peninsula of land on the lakefront at the south end of downtown Chicago, is the perfect example of something hidden in plain sight. Tourists flood the nearby Field Museum, and a steady stream make the trek out to Adler Planetarium, at the point from which the peninsula springs. Yet Northerly’s sylvan trails, looping among the prairie plants, were virtually deserted when I payed a visit on a summer Saturday afternoon. 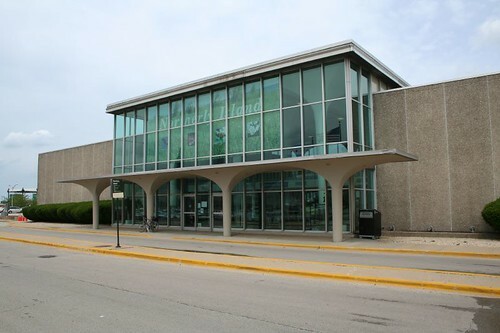 In all my wanderings through the city, I’d never actually been there till recently, when I decided to seek out the site of the long-vanished airport that I knew had once stood on the lakefront. The history and function of the peninsula is, likewise, the sort of thing a non-Chicago resident just wouldn’t know about. The island hosted Chicago’s second World’s Fair, in 1933, but all traces of that event are long vanished. A couple of Google searches reveal that the “long-gone” airport, Meigs Field, closed down just a few years ago (in 2003), and under some bizarre and shocking conditions. 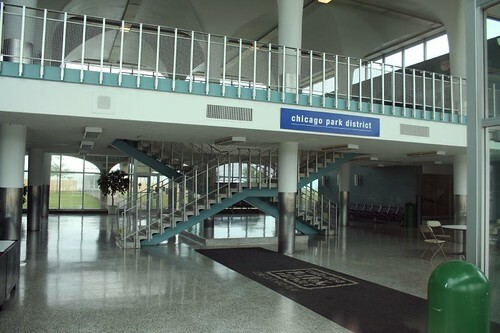 Mayor Daley, wanting the peninsula for park land, cited bogus concerns about terrorism and apparently ordered work crews to go out in the dead of night and bulldoze a series of Xs into the airport’s runways, rendering them nonfunctional. It worked, too; he got his way. The airport ceased operation, once 16 stranded aircraft were cleared out via the taxiway. The city essentially pulled this off with only a slap on the wrist from the FAA. Now there’s talk of the island being a venue should Chicago’s 2016 Olympics bid go through. How conveeeenient! Today, the former airport is a flat space, a replica prairie land (built, ironically enough, on landfill.) A few biking/walking paths loop through it, and a trio of sculptures rise from the grasses. Various structures from the airport remain, including the control tower, various storage fences and sheds, and the terminal building, an unremarkable MidCentury Modern affair of precast concrete panels and glass, enlivened by a nice interior arrangement and a few stock 60s details. The island is nothing stunning or enormously special, but it does offer a nice respite from the hustle of the city, particular as under-utilized as it currently is. The views of the skyline are also unparalleled. If you live downtown, this truly is the place to get away from it all. 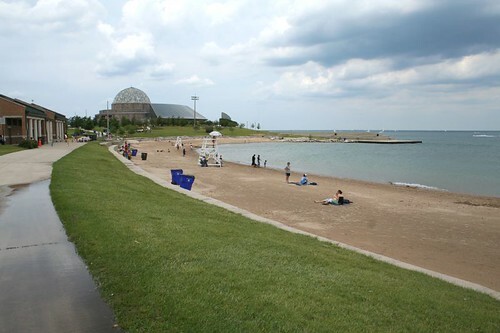 Also hidden away on the peninsula is the 12th Street Beach, a quiet little corner of the lakefront that offers the surreal sight of the Adler Planetarium looming over the sandy beach. 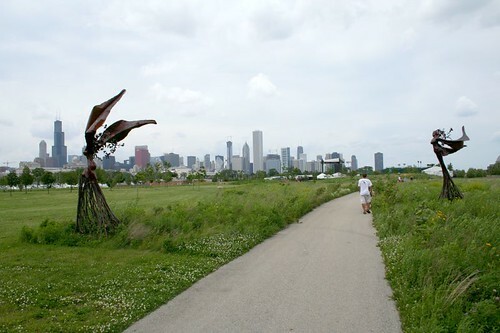 It’s outlasted the World’s Fair, the airport… and might outlast the prairie, if the Olympics come tromping across Northerly Island. This entry was posted in Lakefront, urban planning. Bookmark the permalink. I glad they left the terminal. Just as you love glass block, I love tiny muli-colored tiles, and this 1961 building has plenty of ’em!